Well, it was bound to happen—I mean even a blind squirrel finds a nut once in a while, right? At long last, after two disastrous outings in to the frigid predawn here in Wisconsin, I have spotted 1 of the 4 comets gracing the skies right now. My daughter woke me up this morning with a coughing fit (she’s getting over the croup) and since it was around 4:45am and I was most decidedly awake, I decided to have a wee look and see if I could spot one of the hairy stars up there. If you recall, the last two times I met with failure, and added the indignity of having set up the Yard Canon ahead of time and fully wasted all that effort (and sleep). Not this time. I just walked outside (layered properly under coats and sweatshirts, of course—it was 17º out) with my binoculars and some finder charts from courtesy of Skyhound.com, and prepared myself to fail again. After all, I had heard one report that ISON had been spotted in a pair of binoculars from England. I held little hope of success for today, but like I said, I was awake and why not? The skies were crystal clear, there was no wind, and although it was really quite cold, it wasn’t that bad. Right now, as I type this the wind is howling out there and the sun is shining on a cloudless day, but it feels way colder than it was at o-dark-thirty this morning. At any rate, I stepped out the garage and nearly fell on my back in surprise. I can’t recall seeing this many stars since being out in the middle of the Arizona outback looking for Hyukatake back in high school. I was floored. The sky was ink black and pin-pricked by thousands of perfect, tack sharp unflickering points of light. Orion, tilted down as if stumbling towards the western horizon was glorious. I could see a faint blur near M42 with averted vision but can’t say I saw it for sure. The Pleiades were a beautiful diamond cluster in the sky over the neighbors pine trees. I really was awestruck and just gaped at the sky for a while, soaking in all those ancient protons with glee. Tearing myself away for a moment, I walked around my house and first scanned the eastern horizon (this time with my glasses on—what a difference!) to see if ISON, Encke, or LINEAR were visible naked eye. Surprise surprise, they weren’t. So I started scanning in the spots that the charts predicted the little suckers would be. Strike one, two, three, I was out. But hang on…just a little southwest of Porrima in Virgo there was a faint—ever so faint—patch of light that was definitely not a star, but I could just barely detect it with averted vision. It was there, then it wasn’t. Then I couldn’t see it with averted vision, then I could a few minutes later. I wasn’t quite positive I got ISON, but I think I did. I will revisit tomorrow morning and see if it moved. If it is ISON, I have to say, I am very much underwhelmed so far. But…when I finally turned on the last treat of the morning, C/2013 R1 (Lovejoy), high overhead smack in between Leo and Leo Minor, I got a double reward. First, I noticed for the first time in my life, a blurry patch of light in the crook of the “upside Y” of Cancer. I trained the binoculars on it, because I knew it wasn’t the comet. It was a cluster of stars. I should’ve been in a V8 commercial, because that’s how I felt—SMACK to the forehead—I had spotted M44 with the naked eye. Probably nothing to write home to for most of you out there, but it was a major milestone for me! Other than the Pleiades and M42 (maybe) this is the first Messier object I’ve seen with nekkid eyes! After patting myself on the back, I got back to the business at hand—comet hunting. I slowly trolled with the binocs in the area between the two lions and quickly found a bright-ish patch. I locked on and looked at it for a few seconds and realized I nailed Lovejoy on the first try. It was clearly a puff ball, in side small triangular asterism. I excitedly sketched down what I saw and headed inside as the eastern sky began to lighten. 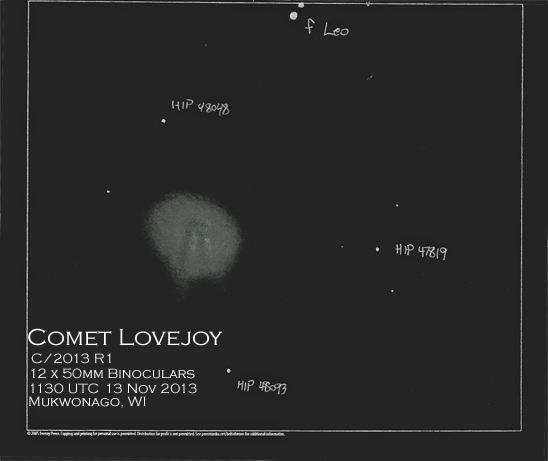 Stellarium confirmed I had captured Lovejoy, right where it was supposed to be! Woohoo! Finally!! Now, keep in mind, this is my first attempt at sketching a comet an the first deep sky (ie, non planetary/lunar) sketch I’ve done in a few years so I’m a bit rusty. And also, the scanner nearly ate the original image, totally washing out the faint cloudiness haze of the comet. I played with scanner settings for a while and came up with something approaching usable, then transferred it into PS and tinkered with layers until I came up with the above image. I noticed a definite darkening in the middle of the coma, with a little bulge on top, which I liken to the symbol for pi: π. I don’t know if that is actually there of just my imagination, but I swear I saw it with direct vision, so I included it in the drawing. The sketch was made with a mechanical pencil and a tissue on copy paper. Hopefully tomorrow I’ll have another sketch or two to show off! I posted a reply on AF as well. You had it much colder than me, here in Maine. You tell a great narrative, very enjoyable to read!